Want to meet someone…without saying a word? Time and again two people who are attracted to each other miss the opportunity to meet. Ironically, they’re often both looking out for a signal from the other. All they need is the right one. That’s where the little signals come in. 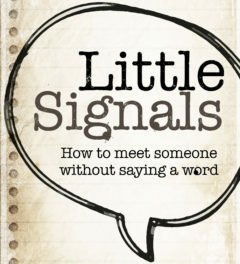 The little signals are small actions that convey an understood meaning. They can be used to meet someone on a subway platform, a bus, in a checkout line, or on a street corner waiting for a light. Anyone, anywhere. All without saying a word. Author E. ElslandePosted on November 4, 2016 November 4, 2016 Leave a comment on Want to meet someone…without saying a word?